The Green Roof Saves Energy! A green roof can save energy because of the multi-layer roofing systems that insulate the school! The insulation cools the school and keeps heat from getting in. This saves Lovett money and energy! 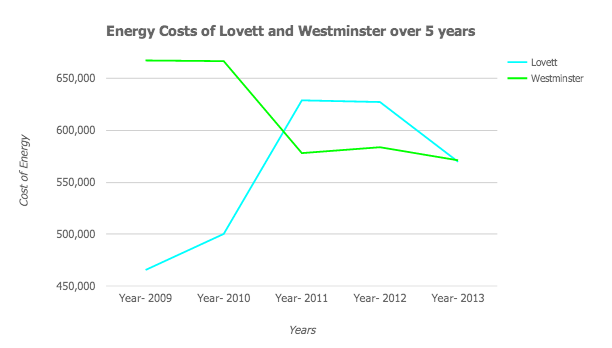 The graph (shown below) is comparing the energy costs of The Lovett School and The Westminster Schools. Since the green roof at Lovett insulates the school, It would make an impact on the schools energy costs per year. So this graph compares Lovett's energy costs to Westminster's energy costs because Lovett has a green roof and Westminster doesn't. Below it is graphed over 5 years. Lovett is the blue line and Westminster is the green line. On the X axis is the year, and the Y axis is the cost in $. These plants and herbs are planted and grown by our very own teachers and students! The water supply runs through the green roof into a cistern and comes back around to water the plants! The outdoor classroom helps students learn while being outdoors! 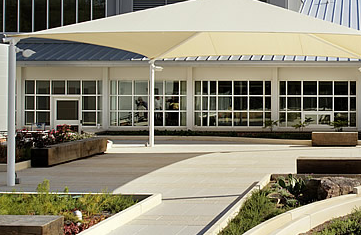 Lovett School. N.p., n.d. Web. 5 May 2015. <http://lovett.org>. Westminster Schools. N.p., n.d. Web. 5 May 2015. <http://westminster.net>.